Thanks to the viral Trololo video, Russian crooner, Eduard Khil or "Mr. Trololo Man' is suddenly a YouTube pop icon. It's hard to say what makes this video so popular today but since it's been uncovered and released to the internet masses, Trololo Man has reached viral video stardom! Personally, we think the appeal of Trololo and the shirts that feature it are due to the absolutely goofy vocals or maybe the tacky polyester suit or maybe it's that those eyebrows on Mr. Khil's head are placed entirely too high on his forehead. Either way, these Trololo t-shirts are HOT and hilariously funny! 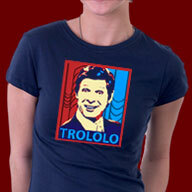 Get your Trololo t-shirt in lots of great styles and colors. 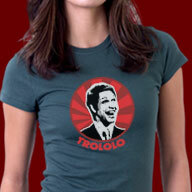 We have Trololo t-shirts for men, women and children. Eduard Khil or "Mr. Trololo Man" as he's known today in his hit Youtube video recorded 40 years ago on a Soviet Television variety broadcast. It's amazing to be able to watch the video today and the humor in it is just priceless. One of our most popular Trololo shirts of all time features 'Trololo Man' in the video that made him a global icon. These trololo t-shirts feature an illustration of Eduard Khil crooning gleefully and the rather dated metal backdrop that's seen in the video. It instantly recalls the viral video and brings instant attention to it's humor and appeal. Fashioned from modern political posters found today, our Trololo Poster T-shirts offer a variety that can only be found here at CuriousInkling.com. We offer high quality, one of a kind Trololo t-shirts printed on famous name brand shirts. It's something you can be proud to own. This is quickly turning into the hottest selling t-shirt on the site. 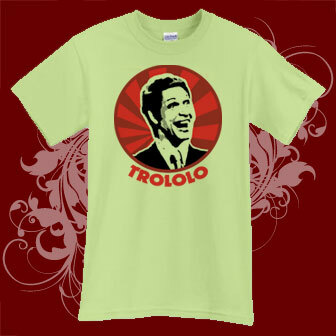 Trololo is such a popular internet meme that it's literally difficult for us to keep trololo shirts in stock. That's why we designed so many. Where other sites might offer one trololo t-shirt we take the idea and design several shirts around it in different ways. Trololo shirts designed with different colors and feeling but all of them are characteristic of the Trololo video and hilariously funny at that. Trololo shirts with loads of fun and appeal only from Curiousinkling.com where fashion shirts are always humorous. 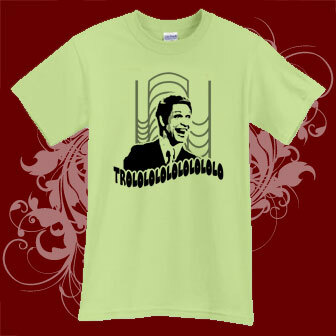 Trololo t-shirts for fans of the hit YouTube viral juggernaut that's taking the world by storm. Trololo videos have been popping up all over the net these days as well as many knock-off videos too. 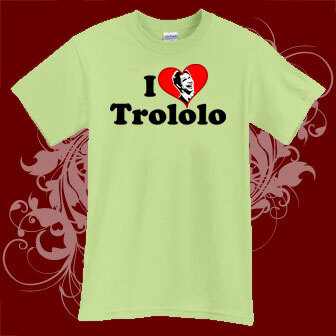 (see below) These funny trololo t-shirts are hip, fashionable and undeniably funny. 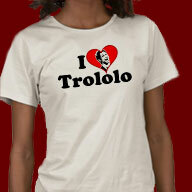 Hey, who doesn't heart Trololo t-shirts these days? The popularity of the very funny video is overwhelming and these shirts are a great tie-in to the phenomena. The internet fame of Trololo Man has spawned hundreds of hilarious knock-off parody videos that are sweeping the net as well. Just below, you can see a video of a trololo parody that originally aired on Jimmy Kimmell Live featuring the star of Inglourious Basterds, Christoph Waltz who played the snooty Nazi SS Officer in the film. Christoph was amazing in the movie and in this video he is surprisingly funny as all get out. We love the video and it makes for a really funny trololo shirt as well. Please see below the video our newest shirt design featuring Christoph holding the violin with the red ribbon. It's such a funny knock-off of the original we just had to design a shirt for it. Shirts like this are rare and make people wonder what the subject matter is about, which of course, is half the fun! 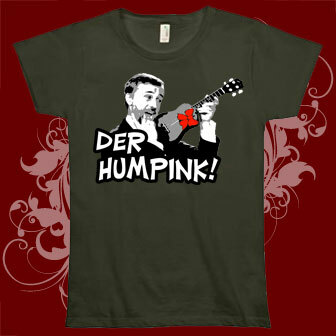 A very funny Trololo Song t-shirt loaded with humor and character. Click the image above to place this hilarious Trololo shirt design on any of the hundreds of style and color combinations you could choose from. 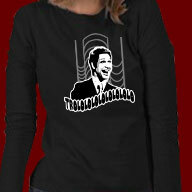 Trololo shirts are all the rage and we think anything that can make us laugh these days is a good thing for sure. We designed this trololo shirt to offer our shoppers a change that isn't being offered at other sites. All original designs on super quality name brand shirts. Only the best shirt designs and shirt selections for CuriousInkling customers! 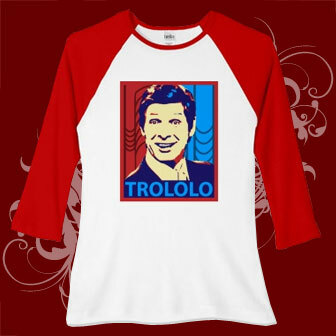 This line of Trololo T-shirts features a cameo of Soviet crooner Eduard Khil about to belt out another chorus of his famous and hilarious rendition of what has commonly been known as the Trololo Song. It's a very unique, funny and attractive design that's well suited for anyone who enjoys the viral video circulating the internet.